Arghyam aims to work to improve access to clean water and the provision of sanitation in a sustainable and equitable manner. 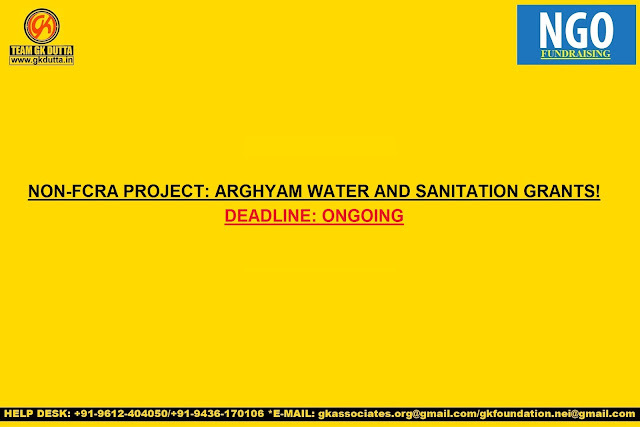 Arghyam considers requests for grants to assist small, medium and large projects in India that meet its vision of safe, sustainable, water and sanitation for all. Arghyam grants funds to NGOs, civil society organisations, research institutions and government agencies, which implement and manage groundwater and sanitation projects in India. Arghyam has made grants to recipients in 22 states of India since 2005, the year of its founding. Grant requests are accepted throughout the year. There is no specific time for applying to Arghyam for a grant. Groundwater and sanitation focus projects that are aligned with Arghyam’s programmatic approach. Projects that work with marginalized communities in rural and urban areas. Capacity building of communities to understand and respond to their local water and sanitation needs. Innovative projects that have potential for knowledge improvement. Projects that demonstrate efficiency in cost per beneficiary, last mile reach, sustainability of outcome over time, institutionalization of successful efforts, etc. Rs 1.19 Crore to Karnataka, India for Government of India’s flagship rural sanitation programme, the Nirmal Bharat Abhiyan, offering a subsidy to construct individual household toilets. Rs 60.67 Lakhs for Mazhapolimaprogramme- a community based and decentralised well recharge programme in Kerela, India. The goal was to set up a project support unit in order to recharge all open wells in the district ensuring sustainable access to water. > Organizations should be registered under Trusts Act, Society’s Act or as a section 25 Company. > 12 A certificate and 80 G certificate from the Income Tax Department.